*Be sure to check out my quick and simple Family Night idea at the end of this post! One night my whole world felt like it was caving in. I felt like a failure at my weight loss efforts, my mothering abilities, and my relationship with my husband. I hadn’t had sugar for 3 weeks but was wanting to drown my sorrows in a VERY large ice cream sundae! I knew if I did, it would only feel better temporarily and then I would hate myself more so I just drove to the gym and walked the track, over and over until I felt better. It took an hour but I came home feeling like I could cope again. I woke up the next morning to my friend standing at my door with breakfast! She knew I was having a hard time and just surprised me. It was the best therapy just chatting together. PMS stinks and sometimes the best therapy for me has always been venting my emotions to a girlfriend. Husbands just don’t cut it in these situations. They just can’t relate, right? Or can they?? My husband will laugh when he reads this because I don’t even think he remembers the following scenerio. “Oh well babe, opposition in all things!” Obviously I didn’t feel sorry for him since I hadn’t eaten any sugar for almost 3 weeks and would have LOVED me some lemon gummy bears! But our conversation got me thinking. Opposition can be so frustrating but helps us appreciate the good times, I love strawberry and cherry starburst, but without the lemon and orange, they would get old fast and not be as special. I love getaways with my husband but would eventually miss my children horribly if they lasted too long. The birth of a child is so intensely special and emotional to a mother because of the long 9 months and excruciating labor she goes through to get that child to this earth. I think about all the hard things we go through in this life! With all the suffering in the world, it’s sometimes easy to wonder if there is God, and why he would allow us to go through so much opposition and suffering! It’s the yellow gummy bears! Without the opposition, without the trials that bring us to our knees, would we ever appreciate the beauty around us? I can tell you that if someone gave me a big bag of red gummy bears they would taste pretty awful by the time I got to the bottom. Thank goodness my Father in Heaven knows me better than I know myself and thank goodness he loves me enough to allow me to experience the pain in life so I can more fully love others and the blessings that come my way! I’m so grateful for my savior Jesus Christ and the example he set for me to follow! I guess as long as I am learning something from my mistakes, I am doing exactly what I was meant to be doing here. And after I’ve fallen, and picked myself up what seems like a billion times, maybe I’ll finally learn enough to get me past that finish line! 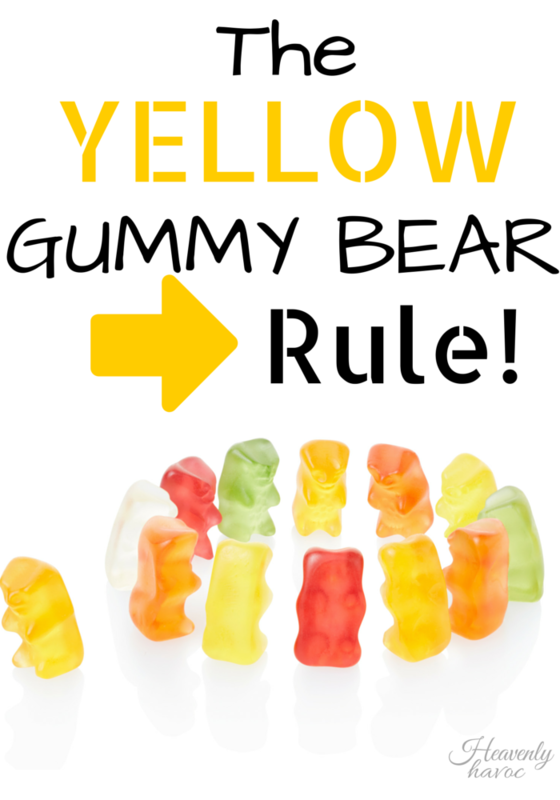 Best of luck with all of the yellow gummy bears in your life!